Why is this important? Because it’s completely backwards to say that Christian unity is a ‘degeneration’ of any kind, and because it means that the Church should be divided based on ethnicity. And if this is the case, removing Jews and other non-Aryans from the Church was no big deal. It also encouraged the view of the German people as superior to other races, which was a key component of the crooked national psyche which allowed for the horrors that were to come. 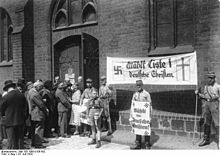 The preference of national identity over Christian identity is most evident in the theological concessions that were made to the National Socialists. This was called ‘Positive Christianity,’ because of its focus on the active aspects of Jesus’ life, instead of the passive. The passive included things such as his death on the cross, which seemed weak; the Nazis found his activist preaching and opposition of institutional Judaism to be much more in line with German principles. This focus was achieved by removing the parts of the Bible that were too Jewish, such as the entire Old Testament, and claiming that Jesus himself was an Aryan. Miracles were downplayed to further bring out the idea of Jesus as a political revolutionary instead of a religious messiah. He became a Nordic revolutionary, fighting against the wicked Jews on behalf of his proud Aryan descendants that were to come. To start this series from the beginning, click here. To read part 2, go here.